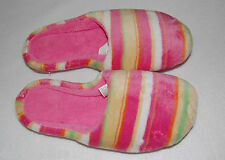 Features: Pink, Green & White Stripe Closed Toe Slippers; Rubber Sole; Machine Wash; Padded. Heel Height: Flat. Toe Style: Closed Toe. Closure Type: Slip On. 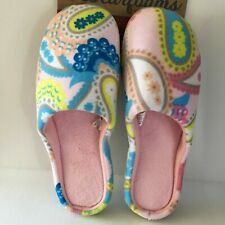 Slippers, Flip flop/thong style, Fluffy terry material, Cushioned insoles, Outsoles great for indoor/outdoor wear, Synthetic material. 100% polyester. 100% Polyester. Give us a shot and we will make sure that you will look to us again! Slide into all-day comfort. A durable indoor/outdoor outsole provides constant support, and cushioned memory foam combines with a fluffy pile design for cloudlike coziness.